STUART — The Berkeley Prep boys swim team furiously trained and planned all year with the hope of beating the giant, Jacksonville Bolles, owners of one the nation's most amazing win streaks — 30 straight state team titles. The hope raised midseason after the Bucs' boys, who were not at full strength, lost just 155-150 to Bolles in a dual meet. Bolles, once again, proved to have way, way too much power. Final boys team scores from the pool at Sailfish Splash Park: 1. Bolles 373; 2. Episcopal 221; 3. Saint Andrews 216; 4. Berkeley Prep 214. "One day we hope to beat (Bolles) but today just wasn't that day," Berkeley Prep coach Kevin Rosepapa said. "We're getting better and stronger and we have a lot that we can be proud of." The Bucs' highlights were none brighter than in their relays, which featured a victory in the 200 free relay with Matthew Dieffenthaller, Logan Ingerick, Peter Tanner and Jack Harrison in 1:23.63; and a third-place showing in the night's first event, the 200 medley relay, where Tanner, Ryaan Hatoum, Christopher Dieffenthaller and Scott Showalter finished in 1:34.71. Christopher and Matthew Dieffenthaller then followed with several solid performances: Christopher taking sixth in the 200 IM (1:53.25), Matthew placing third in the 50 free (20.64) and second in the 100 free (45.02) and Christopher coming back to take fifth in the 100 breaststroke in 58.19. Sprinkled between and around that were more Berkeley highlights, including Tanner in the 50 free (fourth in 20.77) and Hatoum in the 100 breaststroke (57.16). In the girls' team race, Berkeley also finished highest among Tampa Bay area schools, in ninth with 86 points. Bolles also ended up winning its 28th straight girls team title with 381 points, 78 ahead of runnerup Pine Crest. The Bucs' girls highlights included sixth place in the 200 medley relay with Elliot Easton, Allison Holmes, Isabela Arcila and Sabrina Vergara in 1:49.50, and seventh in the 200 free relay in 1:39.24 with Vergara, Arcila, Easton and Maureen Tanner. Shorecrest junior Caleb Kravitz cramped up during the breaststroke portion of the 200 IM, which concerned him a little because his best event, the 500 free, was a few minutes later. Kravitz got a quick massage, pounded down some fluids and felt "pretty good" standing on the starting blocks for the 500. Off he went, taking the lead and pretty much holding onto it, albeit not by much, which is what he won by in 4:29.27, just 0.14 ahead of the runnerup. "Once I got going (in the 500) I felt that I would get a good time," said Kravitz, who hadn't really swam the 500 before this season. "I knew it was going to be close and it feels great to come out on top." Kravitz ended up finishing eighth in the 200 IM (1:57.6). The past few years, Academy at the Lakes sophomore McKenna Smith has juggled volleyball and swimming, competing full time and at the same time in both sports. Standing beside the pool deck Friday night, Smith said now the focus will be solely on swimming. 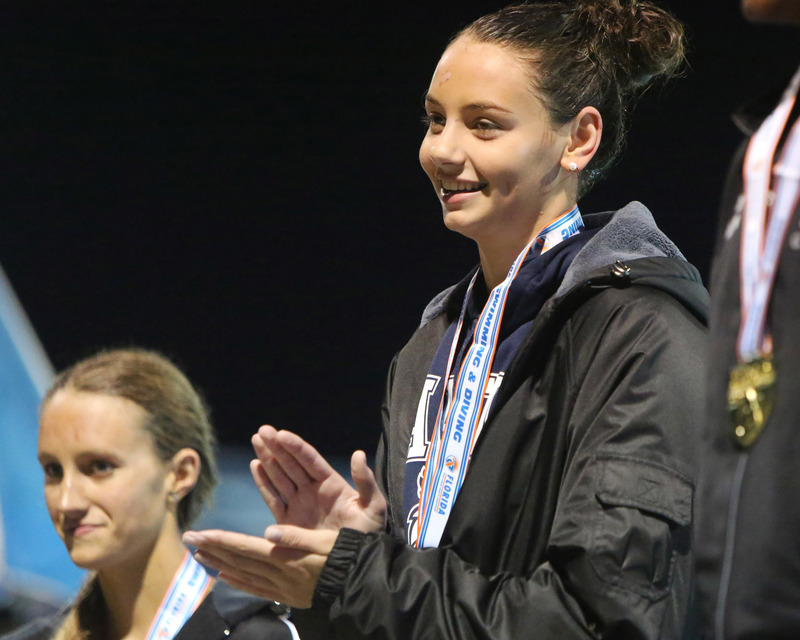 With a silver medal (for finishing second in the 50 free) and a fourth-place medal for the 100 free hanging around her neck, the choice sounded like a good one. "I think swimming is my best sport and I'm excited to see what I might do if I focus full time on it," Smith said. "It was tough to give up volleyball but I feel it's definitely the right thing to do." In the 50 free, Smith clocked a blazing 23.29 seconds and in the 100 free she finished in 50.59. The Tampa Bay area didn't grab diving victories — as many folks predicted — but the bay area still showed plenty of depth. Leading the way were Tampa Prep junior Nicholas Carlin and Berkeley Prep senior Nicole Stambo, who finished as runners-up in the boys and girls divisions. Carlin racked up a nice total of 523.80 points, but fell 9.95 points shy of the winner. Stambo, meantime, finished with 476.00 points, 28.90 behind the winner. 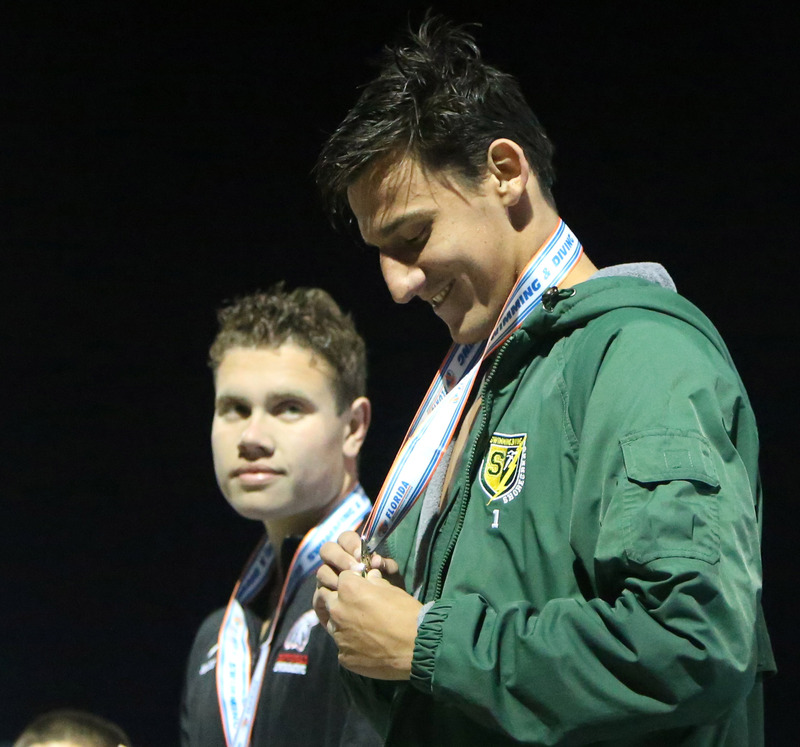 On the boys' side, Shorecrest's Dominic Hoefer placed fifth with 486.15, followed by Tampa Prep's Brady White (ninth, 38.80) and Berkeley's Reed Cecil (10th, 344.80). In the girls' competition, Berkeley's Amy Wotovich was fourth with 425.30 and Shorecrest's Sophie Elwyn was ninth with 364.55. The Mustangs are 18-0 with seven games remaining in the regular season, thanks to steady pitching and steady bats. An “old school” prop sends the message home for the Eagles, who have won 19 straight. Can Hillsborough County sweep the top two classes at state for a third straight year? Districts start next week.